Is There a Dark Side to China’s Robot Gold Rush? Is greed and corruption stalking the great race to automate? Is greed and corruption repeating itself? Indeed, both flourished massively together as China built out its infrastructure beginning in November of 2008. That’s when China launched its colossal $586 billion economic stimulus program that powered the greatest infrastructure building binge in history…world history! In March of 2016, with the launch of China’s 13th Five-Year Plan (2016-2020), as well as with Made in China 2025 the previous May, many multiple billions of dollars were earmarked for robotics and tens of thousands of robot deployments, as China began yet another massive transformation, this time in manufacturing. Billions have already been spent. As Osnos and many others have pointed out, corruption on a massive scale attended the build-out of China’s infrastructure. He writes that corruption was estimated to be equal to half the national defense budget; a budget that Foreign Affairs claims is $145 billion. Half of that is a helluva lot of yuan. That fantastical number is easier to believe when stacked against the coffers of thieves like former security czar Zhou Yongkang’s ill-gotten gains that easily hit into the double-digit billions of dollars. 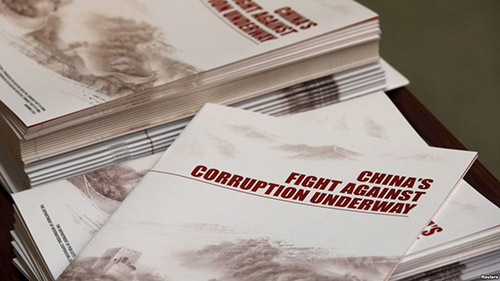 Zhou was but one of hundreds of other corrupt Zhous stripping away China’s future. The South China Morning Post, CNBC and others are reported that a similar wave of corruption is settling into the robot transformation process that could have major disrupting effects on China’s ability to successfully realize either or both the 13th Five-Year Plan (2016-2020) or Made in China 2025, and ultimately, the manufacturing transformation that the country so desperately needs. Such a mega-building frenzy in such a mega-size country with such a mega-size population also witnessed mega-size corruption flourishing right along with all the concrete and rebar. China’s far from alone when it comes to greed, graft and corruption attending large-scale engineering projects. The Panama and Suez Canals, the Tennessee Valley Authority, even the post-war Marshall Plan (1948-1952) had their fair share of mega-bucks siphoned off by crooks to parts unknown. It’s just that China’s epic size and the epic projects it takes on ratchet up the corruption index, making most any global corruption pale in comparison. The temptation is just too sweet and easy to steal from a vulnerable China, even if it’s one’s homeland. These days it seems that both corruption and growth are flourishing together once again as China hurriedly spends billions of dollars to automate Factory China with robots and automated machinery. Even the appearance of wrongdoing, even if totally innocent, can invite unpleasant consequences. Take the case of robot maker Wuhan Huazhong Numerical Control (HNC) admitting in its financial report from last year that it presented “inaccurate information” on its robot sales. In actuality, it hadn’t sold any. The robots are then left unused. 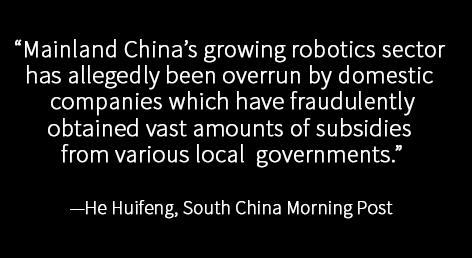 “There remains a big shortage of specialists who can assess the true situation in the country’s robotics industry and determine arbitrary decision-making by local governments in granting subsidies,” Wang was quoted as saying. The Chinese Ministry of Industry and Information Technology, reports that the number of companies claiming to be robot manufacturers has increased to over 3,400 from only a few hundred in the past few years. So why would any company report inaccurate information about sales of robots? One reason suggested by Luo Jun, chief executive of the International Robotics and Intelligent Equipment Industry Alliance, a government think tank, is that when robots are sold, the selling company becomes eligible for subsidies, rents and tax breaks from the government. For example, the province of Guangdong will invest $144 billion on replacing human labor with robots within the next three years for its estimated 60,000 factories. Robot companies like Wuhan Huazhong Numerical Control (HNC) can participate in those subsidy programs, if they indeed make robots or significant robot parts. However, even with death sentences as the fate of some of the most nefarious greed merchants, greed is on the creep again, and no one is naïve to think that it can ever be eliminated. Read a few chapters of the Chou dynasty’s Chuang Tzu (third century BCE) to get a feel for greed’s endurance over the millennia. De-fanging greed’s worst perpetrators would be well worth the effort. With China’s 13th Five-Year Plan 2016-2020 placing robots atop its shopping list, the next five years should see skyrocketing robot sales to China (in spite of the overall economic slowdown). The transformation of manufacturing can’t wait. Such a colossal buildout in automation could also present itself as a colossal opportunity for schemes. China’s ambition to automate itself seems perfect timing for the return of the thieves.